When it's time to take a family vacation, you need to decide what to do with your pets. There are several choices. You can board them, have someone come to your house to take care of their needs (not as simple as watering plants when you are away), or take them with you. All of these choices have pros and cons, so before you make your decision, weigh out carefully what is best for your family and your family pet. Even though they're part of your family, only you know whether or not they'll enjoy traveling. Something else you need to consider is how your pet might affect other people who are vacationing in the same place. If you have a dog that consistently growls at strangers or isn't used to being in strange places, he's probably not a good candidate for the family vacation. Or if your cat often misses the litter pan or scratches everything in sight, other people will have to deal with the fallout. You know she's getting the best care. She's familiar with your family and won't go through the stress of having to deal with a stranger taking care of her. She'll be able to enjoy the extra attention from a more relaxed family since schedules are looser, and the stress of work and school isn't on everyone's mind. She'll get to enjoy some new experiences, sights, and smells. Accommodations may be more difficult to obtain since some hotels, motels, and bed-and-breakfast establishments don't allow them. Your pet might get car sick when traveling for long periods of time. You'll need an air freshener for the car. You'll need to pack extra items for your pet, so if you're concerned about having enough room for everything your family needs, it could get quite cramped in the car. You'll need to stop more often to take your dog on walks, but this could also be an advantage for the family that has been sitting in the car for hours. If you want to go into a restaurant or other place that doesn't allow animals, your pet will be stuck in the car. This is dangerous during the hot summer months. If you're flying, your pet might feel stress from being in the confined space. You may have to pay extra fees for your pet at certain parks or other vacation spots. If you decide to take your animals with you, make sure you train them to be good travelers. Learning proper etiquette in general and for traveling with pets is important. Not only will others embrace the practice if they see a well-behaved dog, your vacation will be a lot more enjoyable if everyone is on their best behavior. Make sure the hotels you book are pet-friendly. Do this in advance to prevent unpleasant surprises while you're traveling. While you're at it, ask about pet policies. If possible, get them in writing. There may be a fee or deposit for travelers with pets. Don't argue about this. If you don't like the policy, look for another hotel that doesn't charge extra. Before you go on vacation, have your animal treated for fleas to prevent infestation in your car and the hotels where you stop. Before you go into any park, restaurant, or other venues, ask about their pet policy. Bring your own blankets to cover furniture that your pet may be on. Avoid leaving your animal alone in the room for extended periods of time. If you do this, why bother bringing him on vacation? 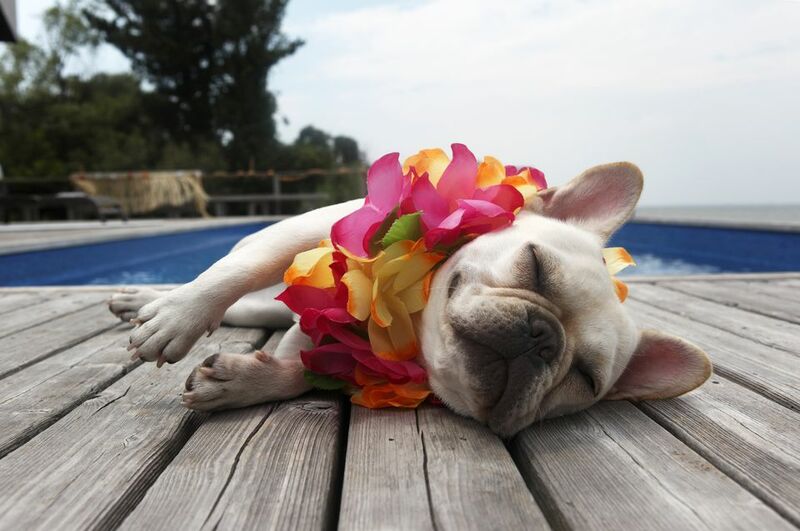 You don't want your dog to start barking and annoy other vacationers or business travelers. Don't allow your dog to jump on other people. This can frighten children and disrupt other people's vacations. Have plenty of toys to entertain your pet so he doesn't chew on the furniture or other items belonging to the hotel. Walk your dog in areas that are designated specifically for that. Pick up after him and dispose of the waste in a responsible manner. If you bring your cat, keep the litter pan clean to prevent smells from wafting down the hall and into other rooms. Keep your animal restrained at all times when you are out of your room. Take your dog out right before bedtime and when he first gets up so he can relieve himself. You want to do everything possible to prevent accidents in the hotel room. Taking your animals on vacation comes with an extra set of responsibilities. Have your pet checked by his vet to ensure he's healthy enough to travel. Make sure all of his vaccinations are up to date and keep his health record with you in case you are asked for it during your trip. Get your dog or cat used to riding in the car. Start out with short trips and then extend them for longer periods of time. Take your pet around other people if he isn't used to strangers. Observe him and reward him for good behavior. Have a safe place for your family pet to ride. This may be a doggie car seat, a travel crate, or special harness. If you don't already have something, discuss options with your veterinarian. Don't allow your animals to ride in your lap or with their heads sticking out of the window. This is dangerous and can injure your fur baby. Make sure your pet has a collar with contact information in case he gets separated from you. Have plenty of drinkable water available. Look into getting a drip bottle that is activated by the animal's tongue. Stop often to fill a water bowl to keep him from becoming dehydrated. Make frequent stops to let your pet relieve himself. Get the airline's pet policy for flying before you make plans. You don't want to get to the airport on the first day of vacation, only to discover they don't allow your dog's breed on the plane. Discuss options to help decrease your pet's stress level with his vet. Have an airline-approved carrier and line it with comfortable blankets with familiar smells to help decrease your pet's stress level. Exercise your pet before checking him in at the airport.